Stephen Poloz, the Harper-appointed chief of our central bank, was in Calgary Monday to talk about resources and "policy lessons." I am not going to quote from the speech as I prefer to focus on what was missing from his remarks. The contents of the speech were the usual mix of Bank of Canada rhetoric such as "the Bank has built up credibility" and confidence in the institution's ability to assess the workings of the economy. Almost immediately after starting the job as Bank of Canada Governor, Mr. Poloz began talking down the currency in an attempt to remake the industrial landscape, but if he has learned any lessons about his policy's role in what ensued, his speech failed to acknowledge it. Specifically, the refusal of the central bank governor to acknowledge the role his institution played in exacerbating the downturn in the oil patch via the premature loosening of monetary conditions was a telling omission. 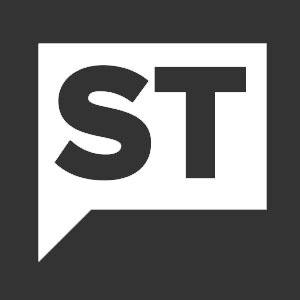 Midway through the government's last term, the Harper conservatives needed to deliver a balanced budget by election time, but they did not want to risk stalling the economy by cutting spending or raising tax rates. However, getting to a balanced budget would be a challenge without taking even more money out of the hands of the private sector and putting it into Ottawa coffers. While they were willing to hoard Employment Insurance (EI) payroll deductions and sell off GM shares, what if that was not enough? Just as worryingly, what if keeping all those EI deductions in the hands of the Finance Minister instead of putting the money back into the hands of Canadians ended up choking off economic activity? What to do under such a predicament? Given the almost two years and a half lead time before the next scheduled voting date, how about hiring an activist at the central bank to juice things up? As it turns out, that is exactly what the Harper Conservatives appear to have done. On May 2, 2013, they appointed Mr. Poloz to the helm of the Bank of Canada and the money supply has never looked back. 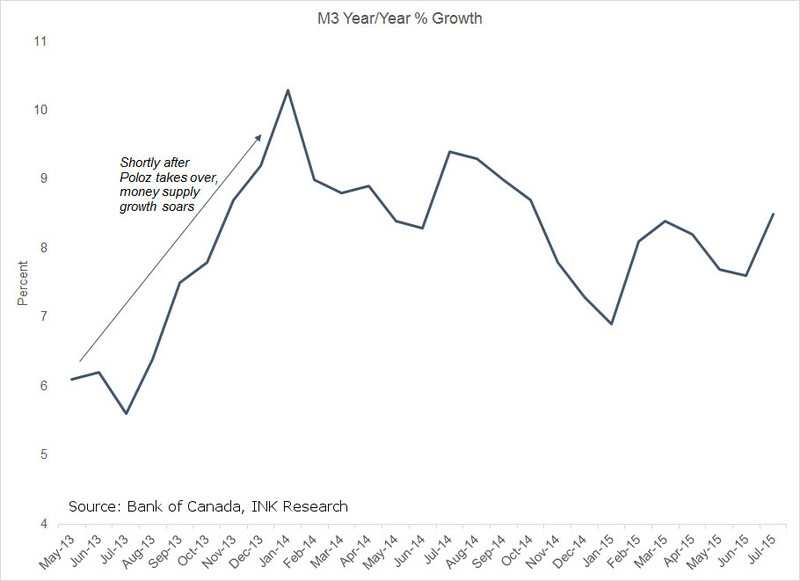 Indeed, M3, the broadest form of money as measured by the Bank of Canada, was up 10.3% by January 2014. In light of an assumed 12 to 18 month lag that money supply growth has on the economy, the effects of this expansionary policy looked set to kick in this year. Except the timing does not appear to have worked out quite as expected. As pointed out on in the blog on September 11th, much of that new money rushed into the oil patch right at the peak, leading to overinvestment at the worst possible time. The last time M3 moved up to the 10% level was in 2007 as the oil price was also heating up. By October 2008, Canada was in recession. Unfortunately for Canadians, the central bank learned no lessons from that period. The result? The central bank let the money supply rip in 2013 even as energy prices were elevated, and now Canada has ended up in a recession this year. History didn't just rhyme, it repeated itself. The Harper conservatives effectively outsourced industrial policy to the central bank with the hope that the economy would appear to have a spark in time for the election. Meanwhile, the government desperately wanted to be seen as economic conservatives on spending. Going liberal on monetary policy was a gamble the Harper conservatives were prepared to take. However, balancing the budget under this Harper conservative policy mix has come at huge cost and risk to Canada. By letting the money flow too loosely in 2013, the Harper-appointed central bank governor left Canada overextended in the oil patch and vulnerable to the gale storm unleashed by our competitors in Saudi Arabia last fall. While the Bank of Canada had lots of help from other central banks around the world in promoting the oil bubble, the dovish tilt out of the gate by Mr. Poloz likely made matters worse. And there may well be other storms brewing out of China and emerging markets that could challenge other sectors of the economy. Unfortunately, Harper economics have left us with little more than a promise of QE from the central bank and a potential of tax credits to fix up the basement should another typhoon come roaring through. The decision to appoint an activist central banker in 2013 should concern every Canadian. The Poloz appointment should particularly concern free-market conservatives given that it was a Conservative Prime Minister who put him in the job. On October 19th Canadians will be able to hold Stephen Harper to account. Free-market conservatives in particular have a chance to send a message to the Conservative Party that using monetary policy as a back door substitute for industrial policy is not acceptable. If we are going to have an interventionist and opportunistic regime in Ottawa, we might as well have one that is honest with its intentions. Who is clapping for Canada's central bank planned economy?